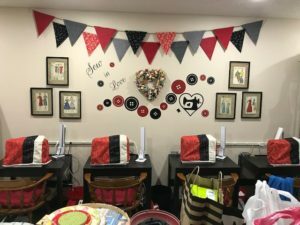 My new sewing studio is finally finished! We moved into a new home with our daughter Stephanie and her family in August 2012. Hard to believe that it’s been over a year already! 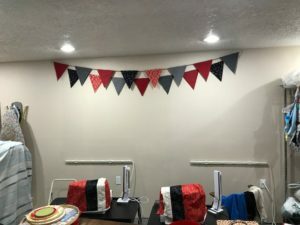 The first thing we did in our new home was put together my sewing studio, where I held classes throughout the year as I continued to work on getting it where I’d like it to be. Putting together the sewing studio has been a lot of hard work and there are still things I would like to do, as always, but for now I will call it finished. 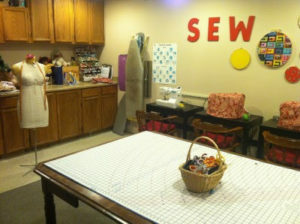 After moving a door, adding new lighting, and painting, the room was ready to start looking like a sewing studio. There are many small (and not-so-small!) elements that came together to make this lovely space in which to sew and to teach sewing. I bought used cupboards from someone remodeling an apartment. They fit perfectly. My daughter Stephanie ripped out her breakfast bar from upstairs and we recycled her counter top with a lot of help from my husband. After adding a ton of elbow grease we made it fit and it looks lovely. I bought four black desks from Ikea for sewing stations. They were just what I wanted. I used to use long plastic fold up tables, but I think the individual stations work much better. I bought four brand new Janome sewing machines from SAVE Stores on Foster and 67th in SE Portland. I’m a big fan of Janome machines, and last year I replaced my computerized machine with this same brand. My mother-in-law left us her table and chairs and with nowhere to put the chairs I decided to use them in my sewing room, giving the room an added charm. My antique walnut table is serving as a cutting table. With square ends and the ability to become longer if I need it, I just love having it there. The rest of the room includes shelves that house the rest of my supplies and fabric. My sister Tonya has come a couple of times and helped me organize and decorate, which has been invaluable. 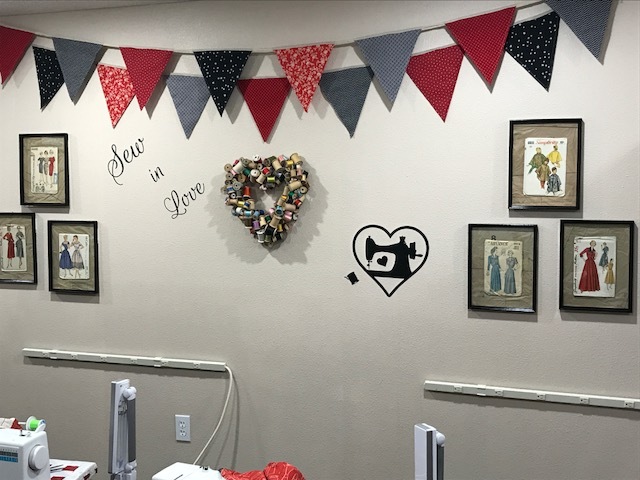 The last time she came we decorated the big wall above the sewing stations. It says it all: SEW in big red letters with hoops in a variety of fabric. And last but not least the door. I bought an antique door, stripped and painted it, and put different handles and hinges. It really tops off this simply lovely space. My dream of having a sewing room/studio has come true. Sometimes I have to pinch myself when I am at my own sewing machine sewing to make sure I’m awake! A fashion show is great fun. With shows like Project Runway taking America by storm, we find that the energy of the participants and the fun in seeing a variety of clothing generates a lot of excitement. Fashion shows are especially fun to watch expectantly when kids are showing off the items they have made themselves. Most of my students spend one day a week from September to May learning to sew. They start with the basics and make items according to what they have learned. June 1st was my fourth annual student fashion show. It is held every year at the Courtyard at Mount Tabor on 60th and Division in Southeast Portland. For my students to share their projects with friends and family and residents of Courtyard is often a highlight of the year. This year was no exception. With sixteen of my students participating, and great weather, we were thrilled to show off our sewing projects in the beautiful outdoor courtyard. Click on the photos below to see the students in their clothing projects!